Geography and weather conditions dictate the type of foundation that is best for you. Because of area weather, they often have issues that require solutions. It’s important to learn why slab foundation service is frequently needed. Sometimes it’s due to shifting soil. Foundation movement can crack slabs and harm the foundation. Fortunately, many problems are easily remedied. The slab foundation is generally referred to as “slab on grade” foundations. Constructed of concrete, they became popular in the 1950’s. In the 21st century, they are still widely constructed. A slab foundation is a large, thick slab of concrete that is typically 4”-6” thick in the center and poured directly on the ground all at one time. The edges of the slab are thicker (as wide as 24”) in order to allow for extra strength around the perimeter. Many foundations utilize post tension cables, while others are reinforced with steel rods (rebar). 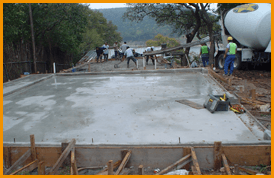 These materials are used in order to make the slab extremely sturdy and capable of bearing the load bearing weight of the house or other structure. The concrete slab is generally positioned on a layer of sand in order to improve drainage conditions and to act as a cushion. A concrete slab does not have a crawlspace underneath it. This type of foundation differs from house foundations with basements in this respect: There is no space under the floor. Basements are typically found up North, whether it gets very cold. A concrete slab foundation is most commonly constructed on property that has been graded, as it should be. It is very important that the soil be graded because if it’s not, the foundation could sink or settle due to poor soil compaction. One of their many benefits is that these foundations are generally less expensive to construct that pier and foundations. Since wooden members such as floor joists aren’t required, as they are with pier and beam structures, that price is eliminated. In addition, since there is no crawlspace under them, utility bills associated with air conditioning and heating are lowered. Another advantage of having a concrete slab foundation is that it doesn’t take long to create them. The slab itself is poured in a single day. Of course, there is preparation work in advance. The entire process can often be accomplished in four days from start to finish, assuming weather is not a problem. Since there is no crawlspace (or airspace) under them, utility bills associated with air conditioning and heating are lowered. Mold and mildew are not an issue, nor or rodents or insects. That’s because there is no space under the slab for mold to form or rodents to nest. They allow for a wider range of flooring options, including stained or scored concrete. The fact that they lack a crawlspace beneath them means that there is no space under the concrete slab that can be used for storage or for placing and concealing utility equipment. As a result, all ventilation, as well as all duct work, must be installed inside walls or up in the attic area. Because the plumbing for the house is located below the concrete slab foundation, plumbing leaks require that any repairs be made by jack hammering the slab in order to fix the leak. This can create a large mess, and is also expensive to have done. Because plumbing leaks are under the slab, you may not be able to detect them until you notice that you have an especially high water bill. Cracks can be an issue because the slab is made of concrete. It’s important to learn why concrete slab foundations crack. Even though concrete is extremely strong, it is prone to cracking due to variations in weather and moisture. It is important to water around these foundations and maintain a constant moisture level. If your house has foundation settlement or slab fractures, you may need foundation service. Schedule a free estimate.